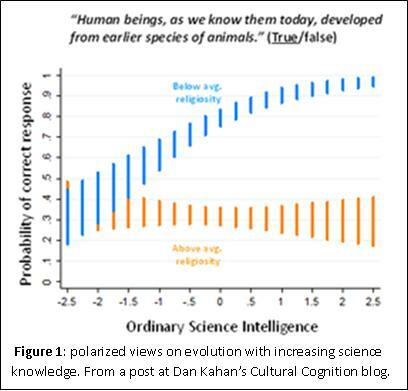 The first big clue as to the nature of this debate comes from Figure 1, which shows that views on evolution in the US polarize with increasing science knowledge. I.e. going right on the X-axis, those leaning more to religion believe (slightly) more emphatically in creationism, and those leaning less towards religion believe (much) more emphatically in evolution. This is a sign of strong cultural influence; polarization of this kind arises because initial bias sets people upon educational paths to different knowledge, and also for the culturally influenced, the use of more knowledge to better support their cultural position. The different gradients for the two lines provides further clues (see footnote 1), but these may be too subtle for our detached robot. At this point it simply assumes strong culture is involved, but is this a CD versus CD scenario, or CD versus ED? And if the latter, which side is which?